Is your laptop keyboard not working? If yes then here I am going to tell you how to fix this annoying problem in laptops. Keyboard is the most important part of a computer whether it is a PC or Laptop. When it fails you won’t be able to type or perform any input operation as it is the major input device for a computer. Laptops come with internal keyboards and most of the users depend on it for their typing tasks. It can happen that your laptop keyboard stops working suddenly because of some reasons. Laptop keyboard not working is a very annoying problem because you won’t be able to type anything and your work will get stuck because of this. So here in this post I am going to discuss all the causes and solutions for “laptop keyboard not working” problem. Also I am going to tell you about the alternatives you can try if your laptop keyboard fails. 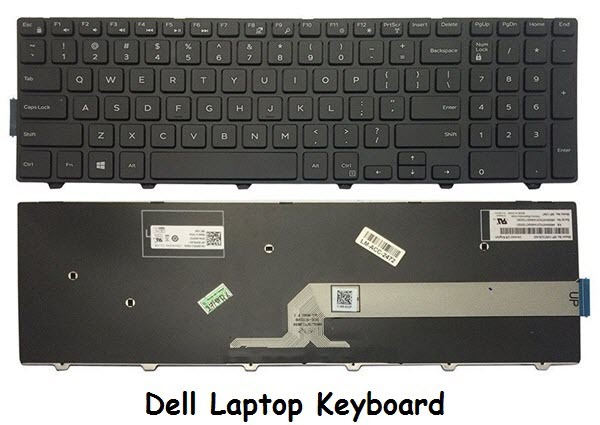 Here are the various solutions to fix laptop keyboard not working problem on your laptop. These are generic solutions and they are applicable to all laptops that include Acer, Dell, Lenovo, Toshiba, Fujitsu, Asus, HP, Sony vaio, MSI etc. The first thing to do when you face such kind of issues is to restart your laptop. It might be possible that some OS or hardware conflicts can lead to this laptop keyboard not working problem temporarily. So here just simply restart you laptop and see if the problem goes away or not. If restarting laptop doesn’t fix this issue then move to the next step mentioned below. It might be possible that your windows operating system files have gone corrupt and because of this your laptop keyboard stopped responding. So here repair your system files and make sure that your OS is in good health. To repair system files launch command prompt in administrator mode and type in the following command mentioned below. If your system files are OK and Windows Resource Protection did not find any integrity violations then move to the next step mentioned below. 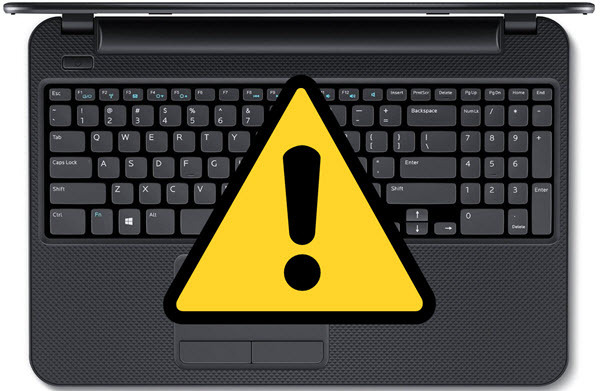 If your computer is infected with viruses then it might be possible that your laptop keyboard stops working or keys are registering wrong with your inputs. Here I would advise you to scan your computer or laptop for any virus infection using a good antivirus. I recommend you to use ESET NOD32 Antivirus. In extreme cases where the anti-virus is also not able to remove the virus, you have to format your laptop and fresh install Windows OS again. If it did not solve your laptop keyboard not working issue then proceed to the next step mentioned below. You can also reinstall the keyboard drivers from the Windows OS to fix laptop keyboard not working problem. First you have to completely uninstall the present or currently installed keyboard drivers from windows and then reinstall the fresh set of driver. To uninstall the keyboard driver click on the start menu and go to Control Panel->Device Manager. 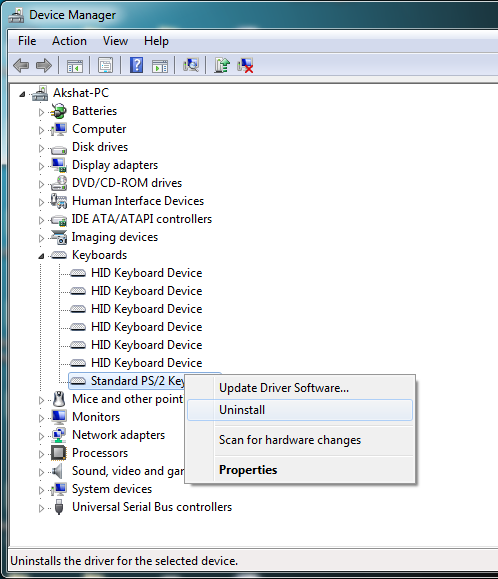 Here in device manager expand the keyboard section, identify your keyboard and then right click and click on Uninstall. After that restart your computer and the drivers for your keyboard will be installed automatically. If the problem persists then follow the next solution mentioned below. If there is no hardware fault then your laptop keyboard should work after the power cycling process. If this also does not work for you then you can follow the next step mentioned below. Sometimes a loose connection of your laptop keyboard connector / cable with the motherboard can also cause this problem. If you are an expert in the hardware field then you can open the laptop and check whether the connection is intact or not, otherwise you need to take it to the service center. If the keyboard connection is in place and the problem is still there then go to the next step. Dust and other small particles may accumulate under some of your keyboard keys and makes them unresponsive. Here you may clean the keys by taking the keyboard out from the laptop but if you are not an expert then you can use an air blower to take out the dust or other things by blowing air on to it. If the laptop keyboard not working issue is still their then move to the next step. It is a good practice to use an external keyboard for the laptop particularly when your work involves a lot of typing. If your laptop keyboard is not working then you can use an external keyboard which will give you more flexibility and comfort during your work. You can either use a wired USB keyboard, wireless keyboard or a Bluetooth keyboard for your laptop. Well if none of the above solutions worked for you then it means you have got a faulty keyboard and you have to replace it with a newer one. You can find laptop keyboards on amazon but make sure that it is for your laptop model. Also you can take it to the authorized service center and get your keyboard changed there as not every user knows how to change the laptop keyboard. Well in the end I would like to say that I have listed the top reasons and fix for laptop keyboard not working problem. If you have anything to ask then you can reach me by leaving a comment below.